The Dublin Unified School District Board of Trustees has four candidates vying for three open seats in the upcoming election on November 6, 2012. To help Dublin voters make an informed decision, OneDublin.org asked each candidate the same five questions. Below is the response received from candidate Dan Cunningham. Responses from candidates Amy Miller, Austin Ogden and Greg Tomlinson are available here. 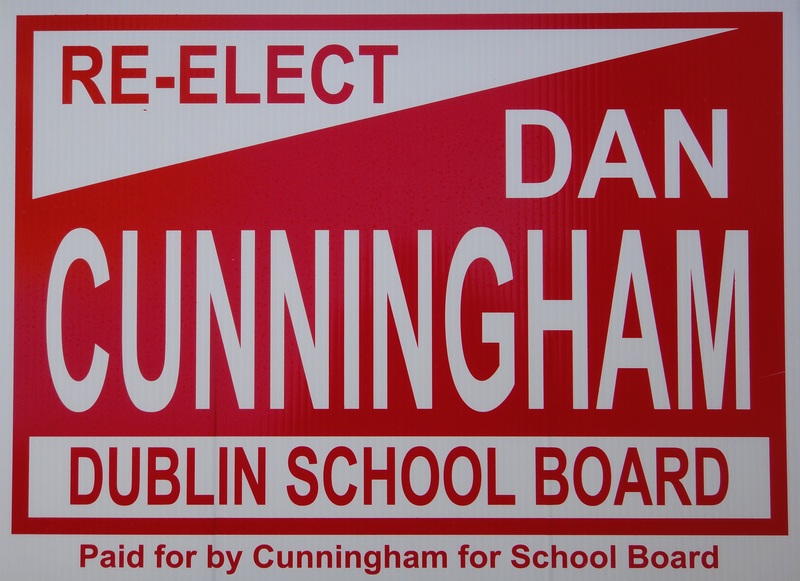 OneDublin.org: What inspired you to become active in Dublin education and run for a Dublin Unified School District Board of Trustees position? OneDublin.org: Dublin is a diverse community in ethnic and socioeconomic terms. What challenges does Dublin face in maximizing learning opportunities for all students? Cunningham: “We are blessed in Dublin to live in a community that is ethnically and socio-economically diverse. Dublin is the most accepting community I have ever lived in. It doesn’t matter how much money you make or where you are from; the most important thing is that you are a Dublin resident. This can be seen at all our schools throughout the district. However, that does not mean that there are not challenges. The Dublin Schools have done a fantastic job focusing on raising the academic bar for students. This is evident in our rising test scores as well as the caliber of colleges to which our students are being accepted. Unfortunately, we still have an achievement gap with our Hispanic, African-American, and socio-economically disadvantaged students. As a learning community, we need to address this issue. We need to look at the root causes of the achievement gap and face them head on. We cannot be afraid to ask the tough questions and more importantly make the tough decisions that will close that achievement gap. OneDublin.org: What is the role of the Board of Trustees vs. the role of the District Staff / Administration / Teachers in ensuring our students are ready for college, a career or public service? Cunningham: “The most important role of the Board of Trustees is to set the direction for the district. This is especially true when it comes to ensuring our students are ready for college, career, or public service. In fact, this is so important that we remind ourselves at each board meeting by reading the District Mission Statement. The board needs to set policies that reflect the above mission. Last year, the board in conjunction with teachers, district staff and parents worked on both the homework and grading policies to ensure the policies are properly aligned with our Mission. One of the key jobs of the Trustees is to continually review district policy to keep them in alignment with our Mission. OneDublin.org: Dublin voters have supported multiple bond measures and a parcel tax in recent years. What role do Board Trustees play in ensuring that the money will be spent in the most efficient and effective way possible and what are your priorities for recently approved bond funds? Cunningham: “The Dublin community is very supportive of our schools as demonstrated by the passage of the Measure C Bonds in 2004, the Measure L Parcel Tax in 2008 and the recent passage in June of this year of Measure E. The Board of Trustees’ role in the implementation of the bond measures and parcel tax is to set the direction and approve the expenditures of the funds. An example of the board making sure that the funds are spent properly as the community wanted is the recent approval for the Performing Arts Center at Dublin High School. The project, as it was presented for final approval to the board, was missing key components that would set the Performing Arts Center apart from other centers in the Valley. The board instructed the staff, after community input, to add an orchestra pit and fly system to the building. By reviewing the project and getting community input, we were able to insure the Performing Arts Center will be a facility that will be an asset not only to our students but the entire community. OneDublin.org: As an existing Board Trustee or as a candidate you have likely spoken to many parents. What are the key issues you’ve heard and how do you plan to address those issues? Cunningham: “The number one issue continues to be the success of all our students. Whether the student is a high achiever or struggles in school, our parents want them to be successful. Over the last four years, Dublin schools have shown tremendous growth in student achievement. Scores throughout the district continue to rise. In fact, DUSD is one of the few districts in the State of California to experience an increase in API each of the last ten years! We are a highly successful district. However, that does not mean there is no room for improvement. As with most districts, we have achievement gaps. Our African-American, Hispanic, socio-economically disadvantaged and special education students are below the level they should be at. Through the Professional Learning Community model, we are working to close those achievement gaps. Our teachers are collaborating on best practices and using data to track what is working and implementing strategies to help all our students.